Need an icebreaker? Want to work out some aggression without shin guards and helmets? Popomatic Trouble, Milton Bradley's classic race-and-chase game, is guaranteed to bring out your competitive side. Try to outstrip your opponents as you race your pawns around the colorful plastic board to safety. Should you have the good fortune to land on a space occupied by another player, you can send him reeling back to start, where he must wait for a six to pop up (literally) on the capricious dice bubble in the center of the board. Once liberated, your foe is free to reciprocate – now you're in Trouble. The crystal ball on which the fates of all rest, a.k.a. the Popomatic Dice Bubble, is the genius behind this game, and is one reason it has become a classic. Encased in its bubble, the die never goes flying, rolls off the table, or gets lost. Simple to learn and exciting to play, Popomatic Trouble is a game that never loses its thrill. Popomatic Trouble is for two to four players. Trouble is the classic race-ahead, bump-back game with the Pop-o-matic die-rolling bubble! Pop the bubble and hop your pegs around the track. Land on an opponent's peg to bump it back home! But don't you get bumped back, or you're in Trouble! Keep poppin' and hoppin' to get all 4 of your pegs to the finish line first, and you win! Trouble includes plastic game unit with PopoMatic die roller, gameboard, 16 plastic playing pegs, and 4 rubber feet. Getting into Trouble has never been this much fun! The game comes alive when you POP the bubble! the electronic talking bubble hands out the commands - discard a card, take one, you never know what's gonna come at ya! Follow along and see if you can steer clear from Double Trouble! The first player to lay down all of their cards is the winner. Featuring a POP-O-MATIC bubble with lights and sound effects, this game is bursting with action and attitude. Includes one die, bubble with colored lights and sounds, and deck of 50 cards. Requires 3 "AA" batteries, included. For 2-4 players. Trouble Rules – Official rules to Trouble, from Hasbro, the publisher of the game. In PDF format. Also available in Spanish. 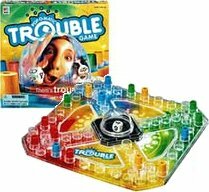 BoardGameGeek – Additional information about the game of Trouble, including photos.